We eliminate the headaches and hassles of cylinder testing and refurbishing - and save you money at the same time. Hudson can help. We eliminate the headaches and hassles of cylinder testing and refurbishing - and save you money at the same time. The condition of a particular cylinder may require the performance of additional work for DOT or TC recertification. This additional work is not included in standard price quotations. 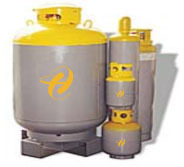 Hudson is a DOT (Department of Transportation) and TC (Transport Canada) approved hydrostatic test facility providing hydrostatic testing, recertification, and complete refurbishment of all refrigerant cylinders from 30# cylinders to ton tanks. A state-of-the-art hydrostatic test facility is operated at Hudson's Rantoul, Illinois facility where the full range of hydrostatic cylinder testing, repair and refurbishment services are performed. Pursuant to regulations specified in the United States by the U.S. Department of Transportation (D.O.T.) and in Canada by Transport Canada (T.C. ), certain cylinders used for transporting hazardous materials are required to be retested, inspected and certified safe for use every 5 years. Certain other cylinders require retests and inspections according to modified schedules if certain conditions are met. For example, cylinders used exclusively for certain listed refrigerants and which are "commercially free from corroding components" and which have a corrosion-resistant external coating may only need hydrostatic retesting every 12 years (49 CFR 173.34(e)(ii)). Other listed cylinders used exclusively for the transport of "fluorinated hydrocarbons and mixtures thereof which are commercially free from corroding components" may be given a complete external visual inspection every 5 years. Recertification procedures and regulations are codified in the U.S. Code Of Federal Regulations (CFR), Federal Register and Title 49, Section 173.34 and Transport Canada (TC) in B339 and B340. Hudson Technologies Company, 326 Main Street, Fremont, NH 03044. Tel: 800-277-3490; Fax: .